Caution: Air Compressor Pressure Switches can be dangerous to adjust. Tool Tally advises you to have your units serviced by a qualified individual and only provides this discussion for your entertainment. 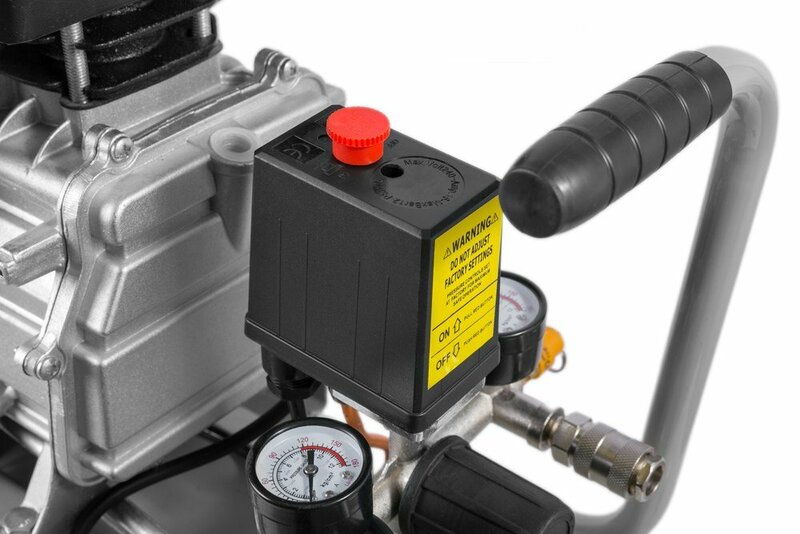 The Air compressor regulator controls how much air flows from your compressor to your air tools. It has a pressure gauge for measuring output. However, the compressor has its own internal pressure switch settings that control the tank pressure by setting the pressure point at which the motor should turn on and when it should turn off. Typically these cut-in and cut-out settings don’t need to be changed from the factory unless you are replacing the pressure switch. The cutout pressure point is the point when the air compressor stops. The point when the air compressor starts is referred to as the cut-in pressure point. On most compressors, the distance between these two points stays the same, but you can adjust the overall pressure up or down. 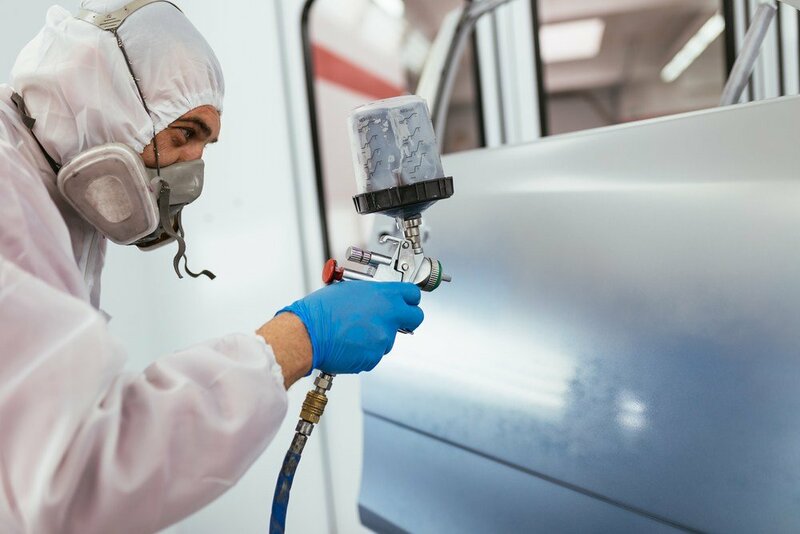 This means that you can adjust it so that your compressor creates more pressure in the tank, but in doing so, you’ll also raise the threshold at which the compressor will kick on. Why do you need to set the right pressure? Safety is always key. Especially on older, poorly maintained compressors, it is possible to push them to the point that they explode. Tool Tally never recommends tampering with your tool’s safety settings in a way that could violate the manufacturer’s intended tolerance limits. Why would you lower the pressure? Efficiency also comes into play. If you don’t need as much pressure, dialing the switch back can make your compressor more efficient, reducing costs and maintenance. This can be handy if you have an oversized compressor and are using it for a job that doesn’t need the added pressure. Increasing the settings can allow you to get more pressure from your existing machine. Maybe you are doing a lot of work with hardwoods or you are working on a project that needs more torque. Dialing up the pressure switch can help you “cheat” that little extra power from your compressor. However, you need to be careful not to exceed your equipment’ safety ratings. Also, be aware that by creating this “artificial demand”, you are going to increase your consumption costs and run the risk of destroying the compressor pump. Before adjusting your pressure switch, check to make sure your regulator is adjusted properly. It can be very dangerous to increase the pressure output of your pump. If it causes a rupture of the storage tank, the results can be deadly. While most tanks are designed to withstand excess pressure, many of them have had water in them for several seasons and are rusted and weakened, making the risk of explosion much higher. Ideally, you should get the correctly sized compressor for the job. As always, check the air compressor manufacturers label for the recommended PSI. Will the Safety Valve limit the Air Pressure? 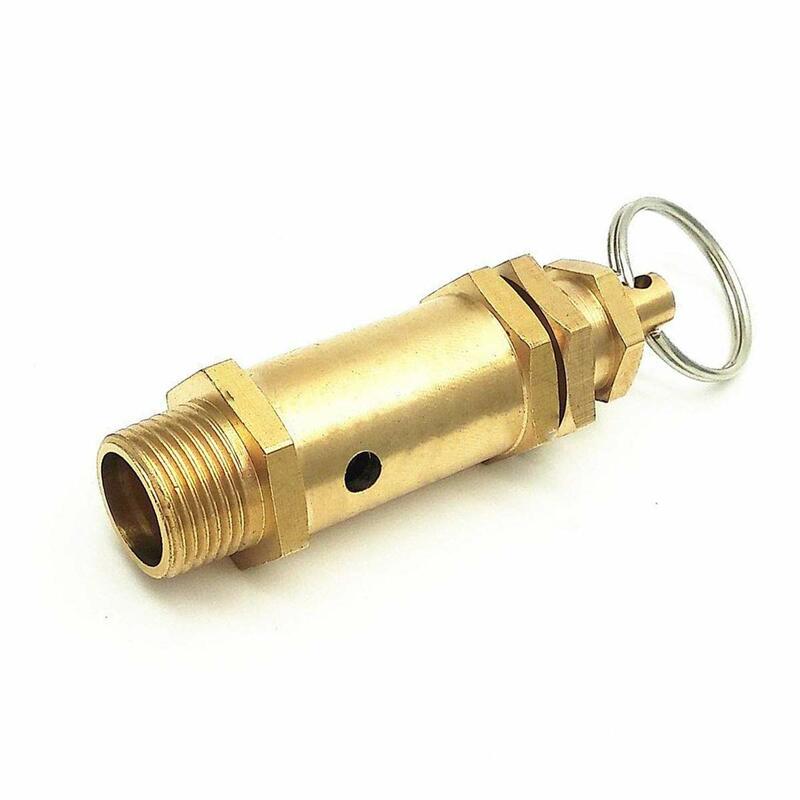 The safety relief valve is set to provide protection of the system from a situation where the pressure in the vessel increases beyond the specified design pressure. Ideally, the safety valve will deploy if the pressure in your tank gets too high. There is a little spring that get’s overpowered by the pressure, allowing the dangerous air to escape back down to a safe level. Typically, we see pressure relief valves rated somewhere around 150 PSI, so it should engage at a point well higher than most tools use. Never tamper with the relief valve unless you are replacing it with another one that is properly rated for your tank. Most compressors have a printed plate with the maximum pressure settings printed on it. When might you want to adjust the pressure switch? You may need to adjust the pressure switch during the replacement of the existing one. The new pressure switch will likely not come with the same pressure settings as the existing one. Before I discuss how to adjust the pressure switch, let me cover the two points: the cut-in and cut-out pressure. The air compressor is built with two pressure set points. These are the cut-in and the cutout. These two pressure set points define the pressure at which the air compressors will engage and begin to create pressurized air, and at what point it will stop and turn off. At the cutout pressure, the compressor will stop, and it starts again when the pressure has dropped to the cut-in pressure point. Based on the above explanation, it is clear that the cut in pressure point is lower than the cut out pressure. The pressure range between the cutout and the cut-in pressure points is referred to as the pressure differential. At this point, we can now cover how to adjust the new pressure switch. Before you start the procedures we shall lay out below, it is critical you make sure that you know the model and the maker of the pressure switch. It is difficult to find the exact switch that was on your compressor, so you’ll likely need to adjust the new one. With this information, you can determine whether it is necessary to adjust the setting. Note that if the air compressor pressure-switch comes with the fixed differential value, a note will likely be included on the housing of the switch. You can also find the information on the differential value in the user manual. The fixed differential pressure switch comes with only one setscrew. For the switches with an adjustable pressure differential, there will be two setscrews: one for the cut-in pressure and one for the cut-out. 1. Make sure you have unplugged the air compressor, and remove the cover off the pressure switch. 2. Before setting the cutout pressure point, you need to-first-set the cut-in pressure point. In most cases, I find the cut-in pressure screw to be closest to the compressor motor. Dialing it in causes the compressor to kick in later — at a higher pressure. Turning it counter-clockwise causes it to cut in sooner — at a lower pressure. 3. Plug in the compressor, and, if there is air in the tank, you can use the drain valve to release pressure (or simply attach a blowgun to your compressor and bleed off air) to observe the new cut-in pressures. If you need to make further adjustments, unplug the compressor before doing so to avoid electrical shock. 4. Ideally, the cutout pressure point is set about 20-40 psi higher than the cut-in pressure. Adjustment is the same: unplug the compressor and turn the set screw one rotation inward to get a higher pressure level and is turned counter-clockwise to get a lower pressure level. Maintain a minimum of 20-PSI pressure range between cut-in and cut-out. Caution: It is possible to set the cut-out pressure so high that the compressor doesn’t turn off, and runs until the safety valve engages, the motor burns up, or the tank ruptures. If the pressure builds to a dangerous level, unplug your compressor immediately. The fixed range pressure switch comes with a single threaded screw on which a spring, together with the adjustment nut, is placed. By turning the nut clockwise, the cut-in pressure is increased. This will also increase the cutout pressure point. When you turn the adjustment screw counter-clockwise, the cutout pressure drops while the cut-in pressure drops by a corresponding amount.